Low-maintenance materials have several desirable attributes. Due to production costs and materials, these products are more costly. Cedar is a reliable and proven decking material, but it requires maintenance. One option is to mix the two materials for your custom deck. Not only does the combination of cedar and low-maintenance look great, it can save money. By combining the two together you can still reap some of the benefits of low-maintenance materials. Some customers elect to combine low-maintenance material as flooring (the decking) and wood elsewhere on their Omaha deck. With the many different colors low-maintenance offers, you will be able to find a great color to not only accent the cedar on your deck but also to match with certain components of your house. Sometimes a nice contrast with the mix of materials will help bring the character of your deck out, and make it a more unique design just for you! A great cost saving material with striking natural beauty! Cedar is considered by many to be perhaps the most beautiful of all wood decking materials. By its nature, cedar, has a wide and varying range of wonderful colors infused in it. In just a single board you may find light tans, pinks, salmons and many shades of brown. 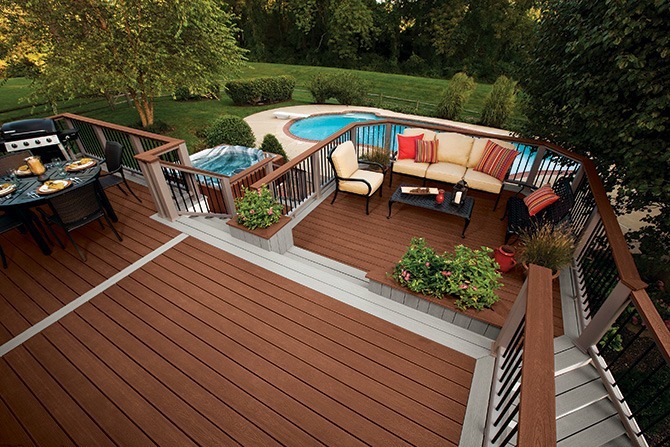 These wide color variations cause many people to fall in love instantly with their new cedar deck. When it comes to your deck, we want nothing but the best for you. That’s why, we hand pick every board that will go on your new custom deck. Only those boards that are strait, solid, and colorful will be used during construction. While cedar decks will require more money and time to maintain over the years, they offer “cost conscious” home owners with a strong, reliable & beautiful deck still within an affordable cost range. When it comes to custom decks around pools or spas, nobody beats Decks, Decks & More Decks. A deck that will hold spa weight must be designed differently then an average deck, and we know how to make them last! Most of the decks we build around pools & spas are constructed using low-maintenance decking material helping to prevent rot and discoloration caused by moisture and chemicals. We can incorporate privacy fences, multi-levels or storage areas for pool accessories. We know how to work around pool pumps and access doors making your new deck a true extension of your pool or spa.